Branched, whitish, upper-surfae corridor; main axis overlying the midrib; side branches overlying the main lateral veins. (In Campanula and Phyteuma the mine is much less branched, sometimes nothing more than a corridor on top of the midrib). Frass in rather long strings. 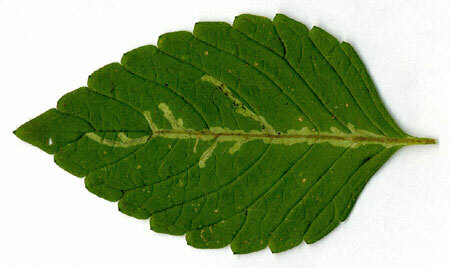 Usually the mines begins as a long and narrow, shallow, tortuous lower-surface corridor that ends upon the midrib but otherwise is not associated with the leaf venation. 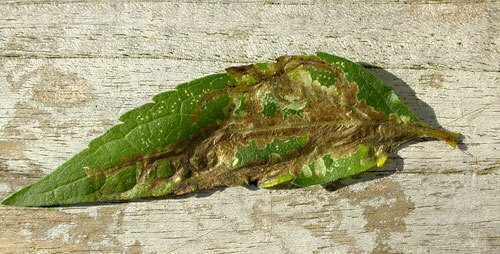 Often this initial corridor is filled with callus, and then even less conspicuous. Pupation outside the mine. Achillea biserrata, millefolium, ptarmica, sibiriaca; Ageratum; Ajuga genevensis, reptans; Alliaria; Alcea rosea; Alyssum montanum; Amaranthus; Ambrosia; Ammi; Anaphalis; Anthemis; Anthyllis; Antirrhinum majus; Apium; Aposeris foetida; Arabidopsis; Arctium lappa, minus; Artemisia absinthium, dracunculus, vulgaris; Aster amellus; Asteriscus; Atriplex hortensis; Atropa bella-donna; Aurinia saxatilis; Ballota nigra; Bellis perennis; Berteroa incan; Beta; Bidens tripartus; Brassica napus, rapa; Bryonia alba, cretica subsp. dioica; Bunias orientalis; Buphthalmum; Calendula officinalis; Callistephus chinensis; Campanula alliariifolia, barbata, glomerata, lactiflora, morettiana, punctata, rapunculoides, rapunculus, rotundifolia, trachelium; Canarina canariensis; Cannabis sativa; Capsella; Cardamine; Cardaria; Carduus acanthoides, crispus, nutans; Carthamus; Centaurea benedicta, jacea, nigra, phrygia & subsp. pseudophrygia, scabiosa, stoebe; Centranthus calcitrapa, ruber; Cephalaria; Cichorium endivia, intybus; Cirsium arvense, acaulon, oleraceum, palustre, vulgare; Cleome spinosa; Cochlearia; Conringia; Coreopsis; Coriandrum sativum; Crambe; Crepis biennis, capillaris, conyzifolia, paludosa, praemorsa, tectorum; Cucumis sativus; Cucurbita; Cynara cardunculus, scolymus; Dahlia pinnata; Diplotaxis; Doronicum pardalianches, plantagineum; Dracophalum; Ecballium elaterium; Epilobium; Erechtites; Erigeron canadensis, speciosus; Eruca; Eryngium; Erysimum cheiri; Euonymus europaeus; Eupatorium cannabinum; Euphorbia; Filago; Gaillardia aristata, pulchella; Galega; Galeopsis ladanum, pubescens, tetrahit; Galinsoga parviflora; Geranium pusillum; Gerbera; Glaucium; Glechoma hederacea; Gnaphalium; Helenium autumnale; Helianthus annuus; Heliotropium europaeum; Heracleum; Hesperis matronalis; Hibiscus trionum; Hieracium lachenalii subsp. 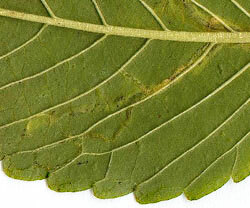 cruentifolium. laevigatum, murorum, umbellatum; Hirschfeldia incana; Hydrocotyle vulgaris; Hymenocarpos circinnatus; Hyoscyamus albus, niger; Hypochaeris radicata; Iberis; Inula; Isatis tinctoria; Jacobaea alpina, erucifolia, vulgaris; Jasione; Jurinea; Kickxia spuria; Kitaibela; Knautia arvensis, sylvatica; Lactuca serriola, virosa; Lagenaria siceraria; Lallemantia iberica; Lamium album, amplexicaule, galeobdolon, maculatum, purpureum; Lapsana communis; Lathyrus tingitanus; Leontodon hispidus; Leontopodium; Leonurus cardiaca; Leucanthemum maximum, vulgare; Linaria; Linum usitatissimum; Lobelia urens; Luffa; Lupinus angustifolius subsp. reticulatus, polyphyllus, succulentus; Malcolmia maritima; Malva sylvestris, thuringiaca; Matthiola odoratissima; Matricaria; Meconopsis; Medicago; Melilotus; Mercurialis; Mimulus; Misopates orontium; Molucella; Moricandia; Myagrum; Mycelis muralis; Nasturtium offcinale; Nemesia versicolor; Nepeta cataria; Nicotiana tabacum; Omphalodes linifolia; Ononis; Onopordum acanthium; Papaver bracteatum, fugax, nudicaule, orientale, rupifragum, somniferum; Peltaria; Pericallis cruenta; Petunia x hybrida; Phaseolus; Phlox paniculata; Phyteuma spicatum; Picris hieracioides; Pilosella aurantiaca, cymosa, officinarum; Pisum sativum; Plantago major; Polemonium caeruleum; Prenanthes purpurea; Primula obconica; Raphanus sativus; Reichardia picroides; Reseda; Ricinus; Rorippa amphibia, palustris, sylvestris; Rudbeckia hirta, laciniata; Salvia glutinosa; Saponaria; Scabiosa; Scorzoneroides autumnalis; Scrophularia; Scutellaria galericulata; Securigera varia; Sedum; Senecio nemorensis, ovatus, sarracenicus, vulgaris; Silene chalcedonica, flos-cuculi, uniflora; Silphium; Sinapis alba; Sisymbrium officinale; Solanum dulcamara; Solidago gigantea; Sonchus arvensis, asper, oleraceus; Spergularia; Stachys; Stellaria; Succisa;; Symphyotrichum novae-angliae, novi-belgii, Tagetes erecta, patula; Tanacetum corymbosum, parthenium, vulgare; Taraxacum officinale; Teucrium; Thlaspi; Thunbergia; Tragopogon; Trigonella; Tropaeolum majus, minus; Tussilago farfara; Vaccaria hispanica; Valeriana officinalis, tripteris; Valerianella; Verbascum; Verbena officinalis; Veronica hederifolia; Vicia; Viola alpina, tricolor; Xanthium strumarium; Xeranthemum; Xerochrysum bracteatum; Zinnia elegans. 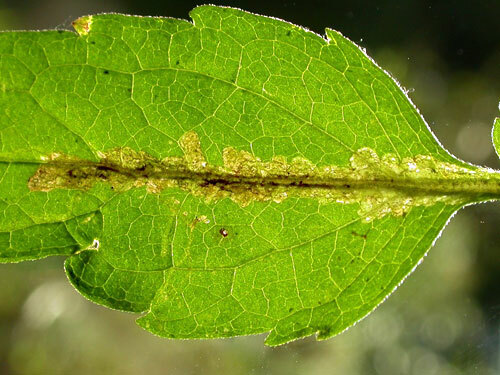 Galeopsis is perhaps the most important hostplant. 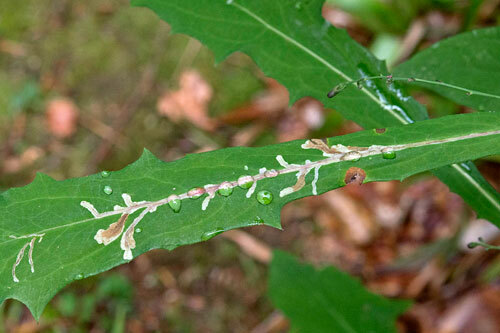 A record by Stammer of Quercus rubra actually refers to Ectoedemia albifasciella. Mines are found from June to October. NE recorded (de Meijere, 1924a). LUX recorded (Ellis, several localities). Entire Europe (Fauna Europaea, 2008). Liriomyza pumila (Meigen, 1830); L. violae (Curtis, 1844); L. galeopsios (Hardy, 1853). 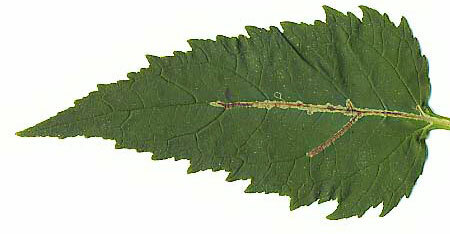 Also Beri (1971d) describes and illustrates the larva, taken from Pisum sativum; however, the accompanying illustration of the mine does not look like the one of L. strigata. Ahr (1966a), Andersen (2016a), Andersen & Jonassen (1994a), Beiger (1955a, 1960a, 1965a, 1970a, 1979a, 1989a), Benavent, Martínez, Moreno & Jiménez (2004a), Beri (1971d), Beuk (2002), De Bruyn & von Tschirnhaus (1991a), Buhr (1932a, 1941b, 1953a, 1964a), Černý (2001a, 2011a), Černý, Barták & Roháček (2004a), Černý & Merz (2005a, 2007a), Černý & Vála (1999a), Černý, Vála & Barták (2001a), Chałańska, Łabanowski & Soika (2006a), Ci̇velek, Çikman & Dursun (2008a), Collins (0000a), Csóka (2003a), Darvas, Skuhravá & Andersen (2000a), Dempewolf (2001a, 2004a), Drăghia (1967a, 1968a, 1970a, 1972a, 1974a), Edmunds (2008b), van Frankenhuyzen, Houtman & Kabos (1982a), Gil Ortiz (2009a), Griffiths (1962a), Hering (1930b,d, 1931-32f, 1932e,g, 1936b, 1955b, 1957a, 1963a, 1967a), Huber (1969a), Kabos (1971a), Kvičala (1938a), Maček (1999a), Manning (1956a), Masetti, Lanzoni, Burgio & Süss (2004a), de Meijere (1924a, 1925a, 1939a), Michalska (1970a, 1972a, 1976a, 2003a), Niblett (1956a), Nowakowski (1954a), Ostrauskas, Pakalniškis & Taluntytė (2003a, 2005a), Pakalniškis (1998c), Papp & Černý (2018a), Pârvu (2005a), Pakalniškis (199a, 1998a,c), Popescu-Gorj & Drăghia (1966a, 1968a), Robbins (1991a), Šefrová (2015a), Seidel (1957a), Skala (1951a), Skala & Zavřel (1945a), Sønderup (1949a), Spencer (1953a, 1971a, 1972a, 1976a), Stammer (2016a), Starke (1942a), Starý (1930a), Stolnicu (2007a), Surányi (1942a), von Tschirnhaus (1999a, 2000a), Ureche (2010a), Utech (1962a), Zlobin (1986b), Zoerner (1969a, 1970a, 1971b).